A 36-year-old man was fatally shot in the backyard of an Escondido residence in what detectives believe was gang-related violence, police said Thursday. 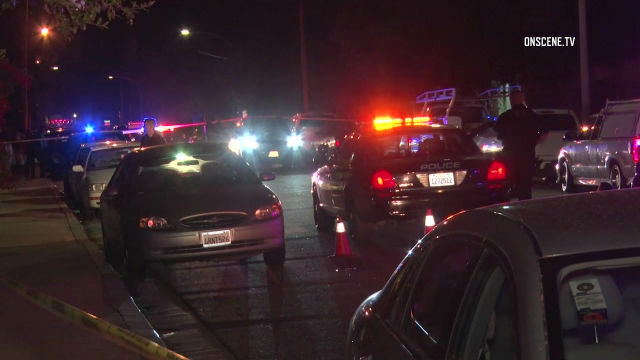 The shooting was reported at 9:47 p.m. Wednesday in the 600 block of North Grape Street, just north of East Washington Avenue, Escondido police Sgt. Ryan Banks said. Officers arriving at the scene saw several people fleeing the area and later found the body of the 36-year-old man, Lt. Chris Lick said. He had suffered multiple gunshot wounds. Homicide detectives were still interviewing witnesses and potential suspects more than six hours after the deadly shooting, Banks said. The street where the gunfire erupted is lined on both sides with town homes, low-slung apartment complexes and single-family homes. Detectives believe the slaying was gang-related, Lick said. The name of the victim was not immediately released. Anyone with information about the shooting was urged to call Escondido police at (760)-839-4722, or the department’s anonymous tip line at (760) 743-TIPS (8477).